Any talk of Southwold and psychogeography is duty bound to include a mention of W.G. Sebald’s Rings Of Saturn. My drift around Southwold yesterday, as part of my continuing Graphic Commons project, did take me up Gunhill, and past both The Reading Room and The Crown, all of which Sebald discusses in his text. These though, are as much of a mention as Rings Of Saturn will get here. I started off on the border of Southwold and Reydon, crossing a bridge over marshland strewn with a road cone and drink cans whose surface graphics made them easy to spot. A new housing development’s temporary hoardings screened building activity nearby and acted as an advert for these future properties. The illustrations that adorned them desperately tried to brighten up the overcast day I had chosen to take this walk. Southwold is known by many for the Adnams Brewery as much as it is for its wonderful beaches. Previously unknown to me though was its School of Industrial Arts building. This is tucked away in a purpose-built house opposite the aforementioned Gunhill. It was set up to help fishermen earn extra income in winter months around the turn of the 20th Century. Predominantly a woodcarving workshop, some of the School’s output was exhibited in the V&A prior to it closing its doors in 1914 as the First World War loomed. This was the most historically exciting thing I found on this particular dérive. I had planned to walk Southwold as a counter-point to my Easternmost Onshore Drift in Lowestoft last year. My intention was to compare the two towns: one being very rich, the other very poor. 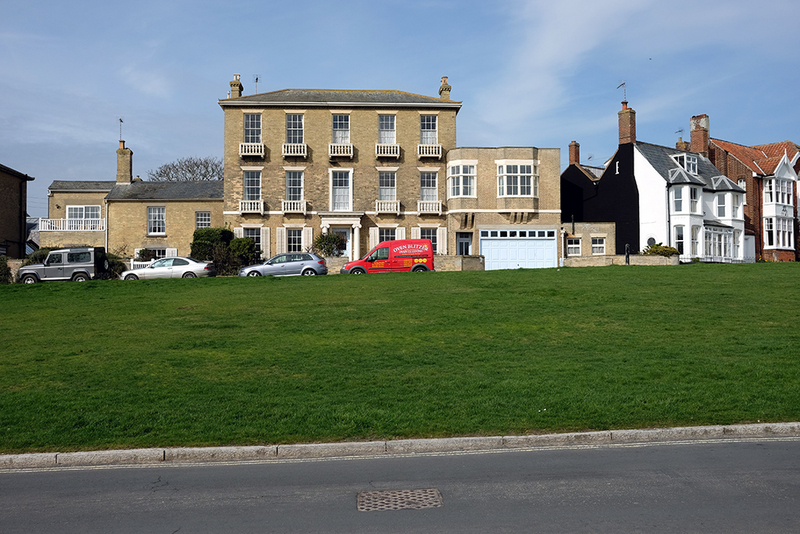 While Lowestoft excited me because I didn’t know it very well, I found Southwold much less interesting as a location for a psychogeographic investigation. I suspect this is because I know it a little too well having bought the dog here for weekend walks many a time. As a result, there was little left to explore with fresh eyes. But familiarity didn’t stop me finding things of note to feed into my research. First was the small-trader vans littering the town’s residential areas. This evidence of self-employed businesses servicing the 57% of properties that are either second homes or holiday lets, (according to The Guardian), included plumbers, builders, glaziers, and cleaners. 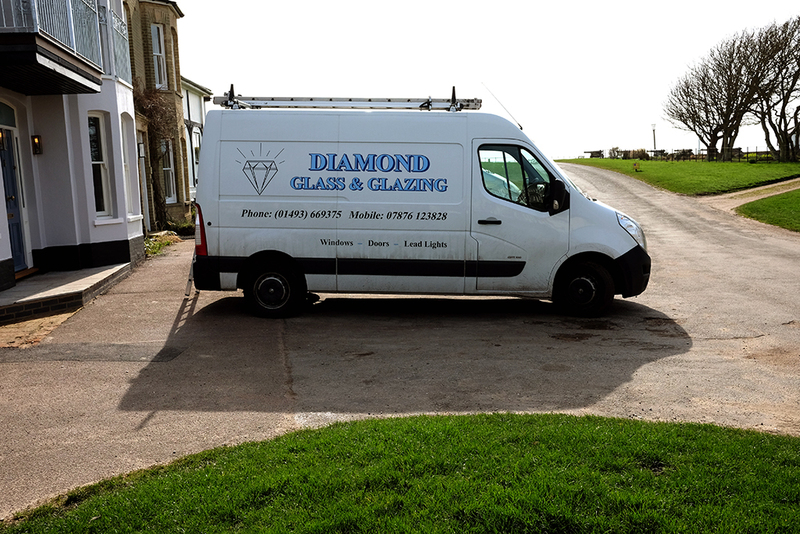 These vans were parked outside many properties, and most with accompanying graphics of varying qualities. I suspect the majority were created by the business owners themselves, either on a home computer or via an online ‘design your own’ service. I half-heartedly wondered whether these traders were getting their own back on graphic designers who visit B&Q at the weekend rather than employing their expertise. In many respects though, the basic nature of these visuals has an honest charm. 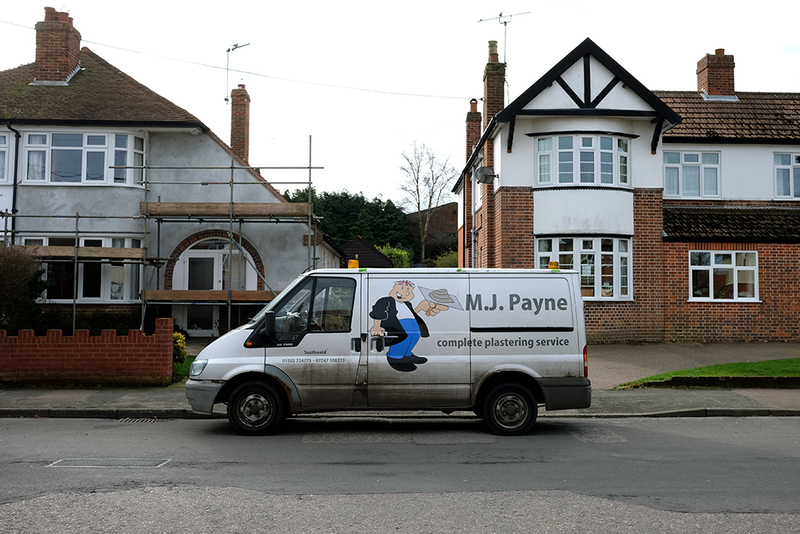 I have a couple of friends who run their own businesses: one is a builder who has commented on deliberately using a misplaced apostrophe on his business card; while the other, a lansdscape gardener, likes handing quotes to clients with a muddy thumbprint on them. This sense of authenticity that they know ‘their’ thing, and won’t charge the earth to pay the bill of an expensive graphic designer, signals a no-nonsense dedication to the job in hand. It creates a bond of trust between the client and the individual who is the business. 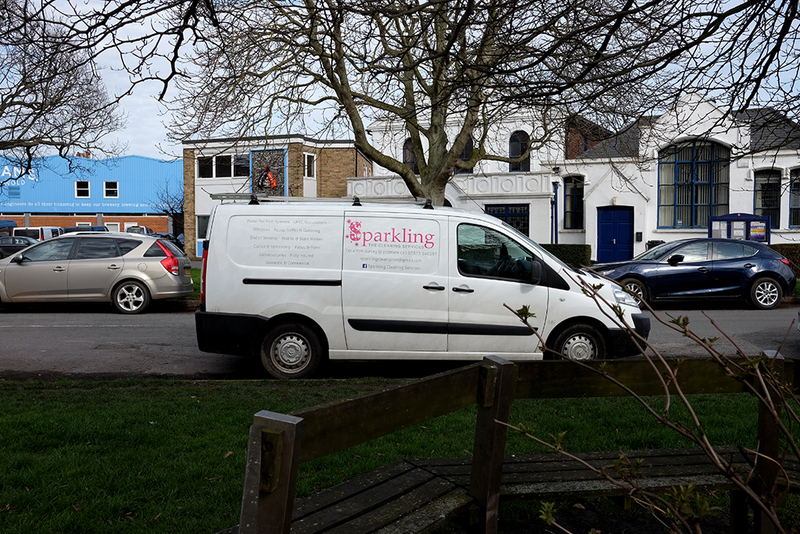 I got to thinking that these vans serve multiple purposes: they are the workshop carrying tools; the office where the trader takes business calls; a picnic area where they eat their lunch; and obviously, a mobile advertising hoarding driven from job to job or sitting in the road to be seen by a client’s neighbours. And if not the sign written vans themselves, then a temporary sign hung on a fence is another way to grab some attention. Many of these small-traders must dread being hit by the National Insurance Contributions increase launched by Philip Hammond in his first budget this week. But no such consternation was evident in the windows of the vans—there was no call to the public to challenge the chancellor through a poster campaign, for example. Unlike that of the boutique shops in Southwold’s main drag, where there is plenty of evidence of a protest against a dramatic Business Rate rise that, these shop owners claim, is threatening their livelihoods. A highly visible campaign has been mobilised with the figure of ‘177%’, the average rate rise, jumping out at passers-by from roadside verges. Alongside this, individual shops display posters stating how much their particular business is going to be affected. Having read about this ‘protest’ in The Guardian the day before, which dressed it up as some sort of middle class revolt, the campaign comes across as very tame and polite when seen in situ. For such a genteel town, this is probably what action looks like to the locals; but it is a far cry from the graphic representations seen in anti-Trump protests happening across the world at the moment. Not that Southwold seems short of things to try to save. From a community hospital to Victoria Street to St Felix Sports Field, there is plenty to keep the budding campaigner busy. And as different from Lowestoft as Southwold is in monetary terms, it has its own concerns and sense of injustice, and it is just as vulnerable as a community to the effects of free-market capitalism as anywhere else.